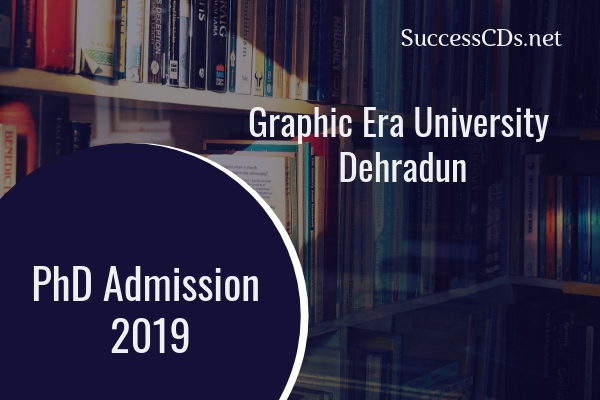 Graphic Era University PhD Admission 2019 - Graphic Era invites applications on a prescribed form for Full Time/Part Time admission to Ph.D. Programmes in various departments of the university. The admission is made on the basis of GATE/NET (UGC/CSIR)/SLET scores or Entrance test and Interview. Graphic Era University Accredited by NAAC with Grade A is known for strong academic achievements and excellence in research. The University offers Doctoral research programs in various academic streams. Available to all such Full Time scholars who are getting financial assistance from any source like JRF etc. Rs. 15000/- per month after the completion of the course work in addition to the scholarship being drawn by the scholar from any other source. Teaching/ Research Associate will undertake 8 -10 hours per week of teaching / research work as assigned by the institute. Available to such meritorious FT research scholars who are not drawing financial assistance from any other source. Rs. 15000/- per month before completion of the course work and Rs. 18000/- per month after completion of the course work.